Prime Minister Netanyahu sparked off a storm on the social network Twitter after he published a tweet in which he wrote that history proves that the strong survive. 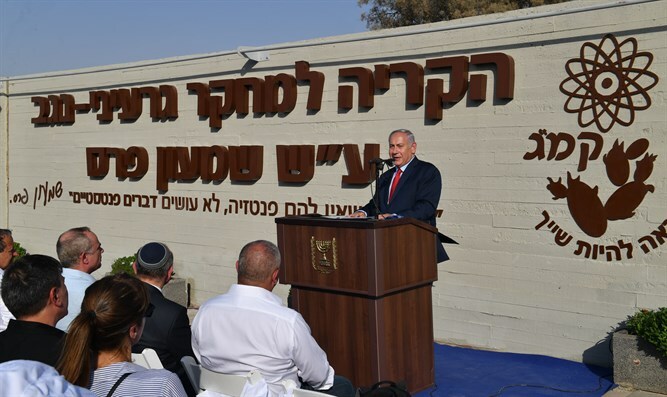 The remarks were made last week in a speech given by Netanyahu at a ceremony in Dimona, during which the Negev Nuclear Research Center was renamed after Shimon Peres - as part of a warning Netanyahu addressed to Iran. “Shimon aspired toward peace but he knew that true peace can be achieved only if our hands strongly grasp defensive weaponry. In the Middle East, and in many parts of the world, there is a simple truth: There is no place for the weak,” Netanyahu said. “The weak crumble, are slaughtered and are erased from history while the strong, for good or for ill, survive. The strong are respected, and alliances are made with the strong, and in the end peace is made with the strong,” he continued. These two sentences elicited more than 7,000 responses on Twitter, most of them negative. “Is that your excuse for murdering Palestinians? ‘Might make right’? What a sad excuse for a fascist,” read one of scores of responses to the tweet. Others compared Netanyahu to Hitler and said that he too thought in such terms.